We got a tip from the popular AT&T developers designgears that over at the venerable XDA-Devs modding community they have set up a separate thread for the soon-to-be-released Motorola ATRIX 4G to discuss its root, created together with Getafixx, and tested on a retail model as well. Wait, what? It's not even out yet, and it has already been rooted? Now that's dedication, why do manufacturers bother to lock the device anyway. 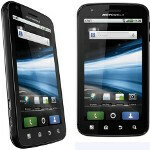 Some of the early preorders of Motorola's first dual-core handset are supposed to be arriving today, as we reported. Now not only you will be the first to own a dual-core handset on a major US carrier, but you can now also be the first to own a rooted dual-core phone, if potentially voiding warranty is not one of your worries. You can find the tutorial here. Good Show, atleast some people will be able to update to 2.3. For those who have an Atrix and have flashed it to gingerbread 2.3, do all of the laptop/ computing functions work as well? Or is a custom firmware necessary?